The last match of what has generally been a rather poor group stage rounds off what had actaully been a great evening of football, hopefully boding well for the rest of the Copa America. Ecuador set up in an interesting shape. It was nominally a 4-4-2, but forward Cristian Benitez was used on the left, pushing up higher than Michael Arroyo on the other side, while Edison Mendez played behind Felipe Caicedo. 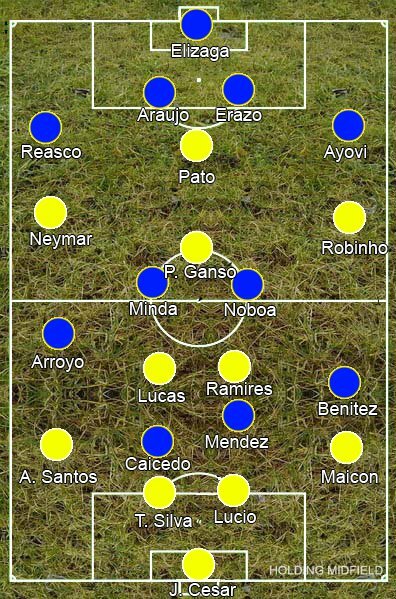 Brazil set up in a system similar to the one Uruguay used against Peru. The front three had looked more willing to track back and help the defence against Paraguay, but it hadn’t been very effective, so Mano Menezes relieved them of defensive duties, setting up most of the team to act as a strong base so the fluid attacking trio could just create. Paulo Ganso was given Nicolas Lodeiro’s linking role and Maicon had Maxi Pereira’s supporting full-back role, while everyone else mostly sat deep and defended. This had previously been Dani Alve’s role of course, but after being shown up by Paraguay’s Marcelo Estigarribia, it was given back to Dunga’s preferred marauding right-back Maicon, and he was given the freedom to run wiht his chance. It’s possible Benitez had been deployed on the left because his energy would make it difficult for Maicon to bomb down the wing, but as he’s naturally a forward-thinking player, he was reluctant to track back, often giving Maicon acres of space out wide. He showed his potential eight minutes in, bursting past Walter Ayovi to send in a weak cross, but, despite the danger he was posing, his forays down the right rarely created any decent chances. At least not until the 72nd minute, when he raced away from Ayovi again to slide in a ball for Neymar to tap in. Instead it was Andre Santos on the other flank, who had looked more inhibited than his right-sided equivalent, that created the opening goal. Ecuador’s lack of pressing and deep defence meant he was allowed to stand up and pick out a pinpoint cross for Alexandre Pato to head in. Now needing to the ball back so they could get a goal themselves, Ecuador began to close down more, but Brazil were finding it easy to knock it around them so they eased off again, perhaps just looking to make it to half-time and regroup. They didn’t need to though – Ecuador won the aerial duel from a simple long ball forward, so Caicedo was allowed a shot that Julio Cesar made a hash of, gifting them the equaliser and allowing Ecuador to continue with their previous tactics. Much like linkman Lodeiro against Peru, some quick thinking and great close control from Ganso set up Neymar’s goal, him receiving the ball in little sapce and casually slotting it through the defence, only for Ecuador to equalise yet again – poor defending letting Caicedo get another goal. Not that that lasted long either – Marcelo Elizaga spilling Neymar’s shot into the path of Pato for his second, before the aforementioned Maicon-Neymar link-up to seal the win for Brazil. Ecuador probably gave Brazil more of a game than many expected (or possibly not given Brazil have been so underwhelming thus far) but their loss to Venezuela had ensured their chances of progressing were pretty slim. Brazil, on the other hand, looked to have finally kicked it up a gear – whether or not it was just Ecuador making them look good, Brazil’s attack looked incisive and unpredictable, although weaknesses in defence means they remain unconvincing. isnt this the same system as brazil 1st game with only one personnel change? Brazil pressed higher and one of Lucas or Ramires looked to join the attack against Venezuela. It was similar, but not quite the same.